Heirloom Kitchen in Old Bridge is a quaint kitchenware shop and culinary center run by mother and daughter team Judy Rosenblum and Neilly Robinson. 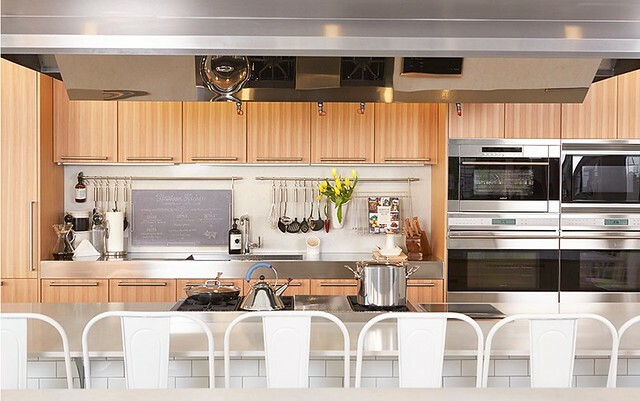 The shop is lovely and filled with gadgets and wish list items for every cook, but part of Heirloom Kitchen’s attraction is its unique cooking classes, which take place in an immaculate and well-appointed in-store kitchen. Heirloom Kitchen offers a variety of class options from hands-on pizza and Italian food, to Spanish tapas and easy Chinese, to gluten free and vegan, to French macaroons and donuts. The HK team focuses on putting together classes with different kinds of cuisines, bringing in chefs from New York to Philadelphia. 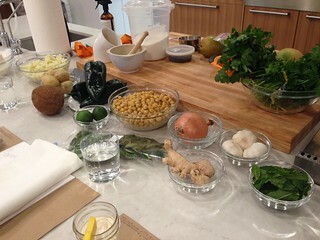 Though comfort food classes tend to be most popular, there really is something for everyone. 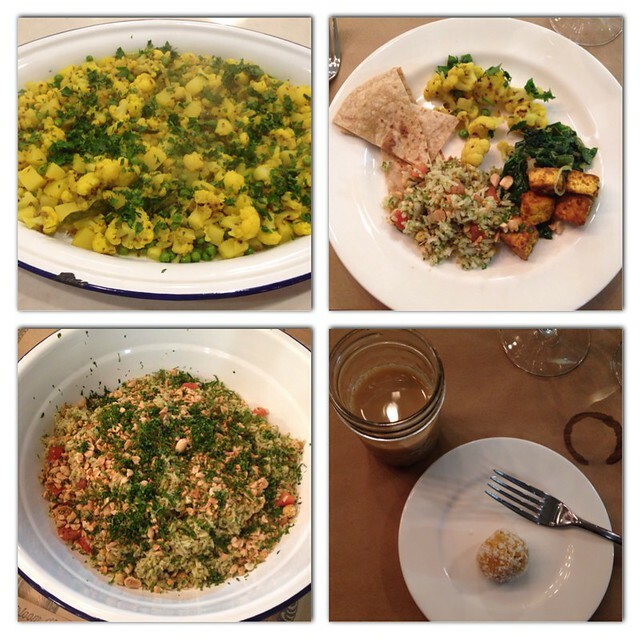 I had the pleasure of attending a vegan Indian class, taught by Alexa Weitzman of Sustainable Pantry. Upon arrival we were greeted with a homemade coconut mango lassi and a booklet of recipes that we would be making—all of which sounded delicious. 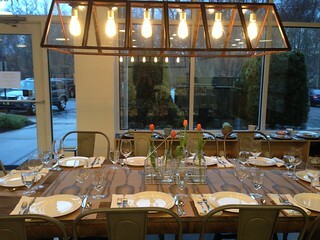 After each class, the group enjoys the fruits of their labor with a complimentary glass of local red or white wine at the kitchen’s communal table, which is simultaneously rustic and elegant. The class in itself was fun, but leisurely eating our culinary creations while chatting and sipping wine was the best part. The crowd was sociable and the food was delicious. 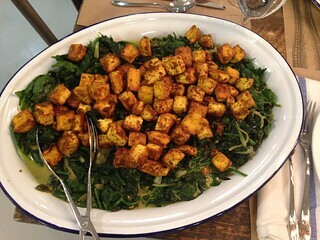 Check out the sample recipe below to try the Saag Tofu in your own kitchen. Click here to check out their list of upcoming classes and see if there’s one for you. 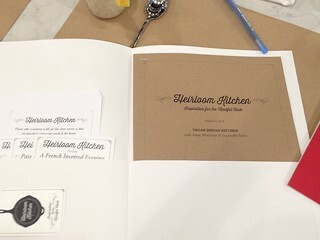 Also follow Heirloom Kitchen on social media for updates and food inspiration: Facebook, Twitter, Instagram, Pinterest. 1. In a small bowl, combine curry powder and 1/2 teaspoon salt. Toss cubed tofu in spice mixture. 2. Heat 1 tablespoon coconut oil over medium-high heat and add the tofu. Leave the tofu in the pan without disturbing it so the tofu sears. After four to five minutes, turn the tofu to a non-seared side, and continue cooking this way until most of the sides are golden-brown. Add more coconut oil if necessary. This step will take about 15 minutes, and shouldn’t be rushed. When cooked, remove tofu to a plate and wipe out pan. 3. Heat another tablespoon of coconut oil over medium-high heat, and add the sliced onions (and poblano pepper if using), and cook until soft and translucent. 4. Add fenugreek and cumin, stirring for a minute or so until the spices are fragrant but not burned. 5. Add spinach, water, garlic and ginger, and cover the pan for two minutes to allow the spinach to steam. 6. Remove cover, and toss everything together. Add 1/4 cup coconut milk and stir to combine. Season with a pinch of salt. 7. 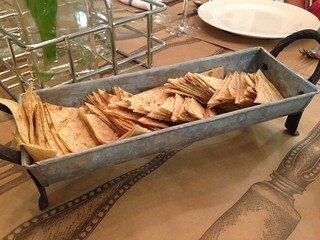 Transfer spinach to a platter, top with tofu, and serve with Basmati rice. For a look at Jersey Bites’ previous coverage of Heirloom Kitchen, click here. Melissa Baratta has been cooking and exploring the restaurant scene since the age of 12 when she first discovered the Food Network. Originally from Vermont, she is passionate about healthy and sustainable living, and loves to experience new flavors from around the world. She is a pescetarian with a love of fresh seafood, but is married to a full-blown omnivore, so her recipes range from unique salads, homemade pastas and grain dishes to grilled fish and curried chicken. She lives in Ocean County with her husband and young son, and when she’s not working at her Manhattan-based PR agency, she can be found cooking, gardening, and checking out local eateries. Melissa blogs about food and healthy living at www.SomeSugarAdded.com.